A Russian farmer with cerebral palsy in Russia’s Far East has seen his dream come true after well-wishers helped him buy a greenhouse. Vladimir Tonkonog has had a number of setbacks, but it hasn’t stopped him from trying to provide for his family. Tonkonog is a true family man. His two daughters aged four and eight and his wife, mean everything to the 30 year-old. However, life has not been easy for Vladimir. He contracted cerebral palsy as a child, but rather than hampering him, the disability has spurred him on to try and achieve as much as possible in life. “I have a disability (cerebral palsy) but I am not despondent and continue to do what I can. I have the strength and willingness to work, but the most important thing is that I know my family depends on me,” Tonkonog said on a post on his Facebook page. Tonkonog and his family live near the town of Pogranichniy, in the Primorskiy Krai region of Russia’s Far East. In 2011, the family was forced to sell the flat they owned in the settlement near the Chinese border and relocated to a house. He had accumulated a number of debts after businesses involving yarn and then homemade beer didn’t turn out as he hoped. This gave Vladimir the idea to try and make a living as a farmer. His disability proved to be no obstacle, as he busily took to tending his chickens, rabbits and vegetable garden. Despite putting all is energy into his new business, Vladimir suffered another setback after the authorities took away 50 percent of his disability allowance. His dream was to obtain a greenhouse, but even a small one cost 60,000 rubles ($1,056), which was way out of his financial means. Vladimir has been growing vegetables in his garden for the last three years, but given the severe climate in Russia’s Far East, where temperatures in May can still drop below freezing, growing produce can prove to be a challenge. 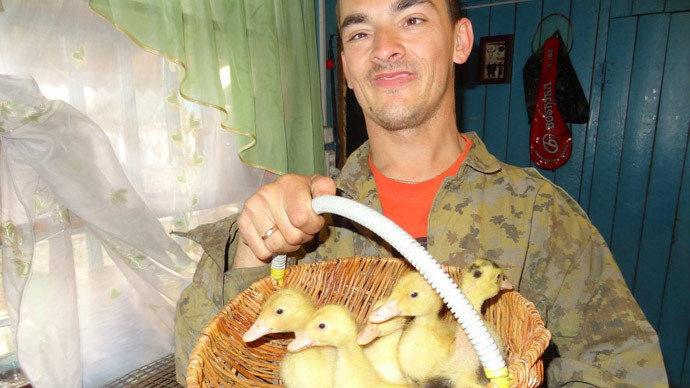 Vladimir’s prayers were answered when well-wishers sent money online, which enabled him to buy the greenhouse. He turned 30 on March 27 and was able to celebrate that landmark a few days later, as he finally assembled his long awaited greenhouse in his vegetable garden. Tonkonog’s wife Oksana has constantly supported her husband. She added that he is “an amazing person,” who will always try to deal with any problems the family might face himself, even though she knows deep down he worries about the family’s predicament. “He gave our daughters the most wonderful New Year. He posted an article asking people to wish his daughter’s a Happy New Year. A number of people came forward and sent them a lot of presents. It was the most memorable New Year for them,” Oksana said on her Facebook page. Vladimir is still in need of funds to try and expand his business. If anyone wants to help the 30 year-old family man, donations are still more than welcome.